Last month, an operative was using a jackhammer when he struck a 120 CNE 3 Phase low voltage cable, which led to an Arc Flash incident. 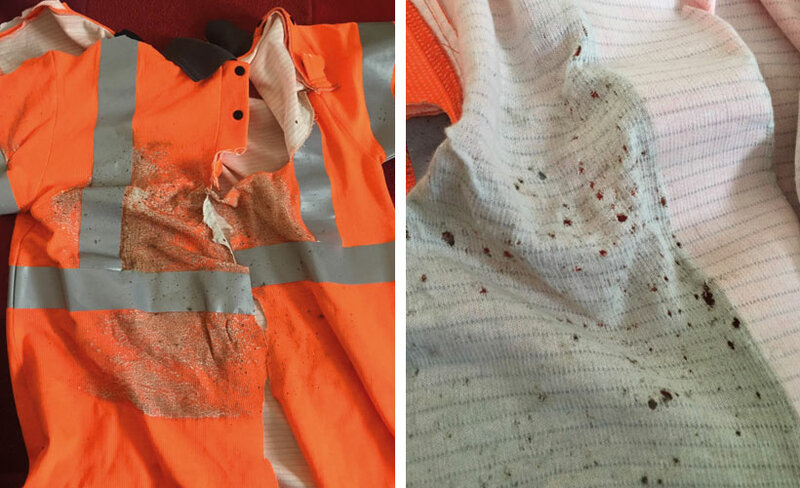 As he was wearing one of ProGARM’s polo shirts at the time, his chest was protected and as you can see from the photographs, his polo shirt took the brunt of the impact. We are aware of how effective these garments can be when faced with an Arc Flash incident, but it’s rewarding to produce a polo shirt that demonstrates its value during a real life incident and ultimately saves an operative’s life. It’s only when you see ProGARM’s Arc Flash garments in action like this that you realise how vital they are to saving lives in the field. We can perform every test available on our range of protective clothing, but to see real garments in real situations saving real lives is the ultimate proof of our success. When an Arc Flash incident occurs, we know that our protective garments are up to the job. ProGARM’s commitment to Arc Flash protection only increases when we see incidents like this. We know that our clothing protects your teams from Arc Flash hazards and related flame incidents and that makes us determined to improve our garments even more. We put our garments through tough testing procedures before we offer them to you. Our unique VXS+ Fabric ensures inherent protection from Arc Flash incidents with its instant extinguishing properties. We consistently innovate and improve to ensure that when an Arc Flash strikes, your team is protected by ProGARM.